Tea towels come in such lovely designs these days that you’ll be able to sew up these tea towel pillows to suit almost any decor theme. This easy pattern also makes a great beginner’s sewing project, as you don’t need to worry about fraying fabric edges or cutting out the pattern pieces. For my pillow covers, I used a standard tea towel and a 12 inch by 17 inch pillow form. The tea towel fit perfectly on my form when folded in half length wise. You can, if you like, use two tea towels to make a larger pillow. Just sew the tea towels, right side together, to the desired size. For my pillows, I folded the tea towel in half length wise and then stitched the long seam and one short seam together. I also inserted a zipper along the open short side for easy removal of the pillow cover for washing. If you don’t know how to insert a zipper, you can simply stitch together the side seam after inserting your pillow form. Tea towel pillow covers are easy to make, inexpensive, and will still look good even after repeated washing. 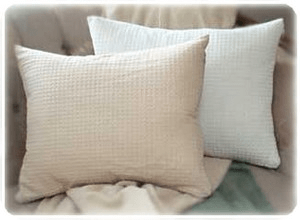 Perfect and very practical as car pillows for your next long trip, but handy in the family room, or as a decorating accent on the bed as well. Copyright &copy 1999-2014 Susan Spatone All rights reserved.